Like many, I was born in King Street Maternity Hospital in 1944. My Grandfather owned and ran the Gents Barbers, G. H. Sharman & Son, at 99, Vicarage Road, near the Cemetery. This was in the family for over 150 years. His first premises was on the corner of King Street. The family originated from Long Buckby in Kettering. Mr. & Mrs. Percy Wells owned the newsagents nearby where my mother did cleaning. Mrs. Beckett had a lovely bakers shop on the corner of Farraline Road and as a child I used to venture in with caution and stand at the top of some steep steps leading to where the bread was baked, but I was always warned never to go down there. A Gibson’s butchers was on the other corner. 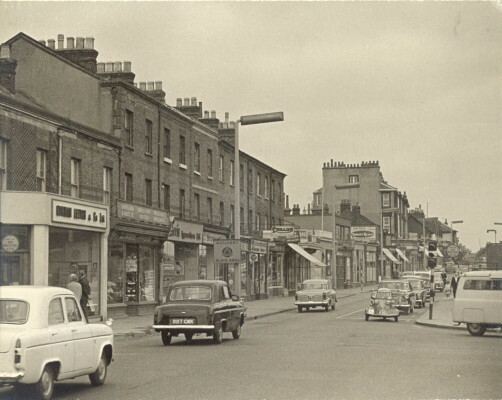 Although trained as a barber, my father decided, at the age of 14 to take a job at W. H. Lavers, Timber Merchants in Merton Road where he worked until he retired. We lived on the Harebreaks Estate in Middle Way. I remember the immediate families from the Halward’s, Butcher, Jefferies, Violet, Culverhouse, Wright, Needle, Bunnage, Frost, Atkins, Holbrow. I went to Alexandra Infants School, Parkgate Junior and Leggatts Way Secondary Modern. On leaving I was told by the school I would have to work at Yeatmans sweet factory in Cherry Tree Road, later owned by Mothercare, but my mother hoped for more, sending me to the Commercial College in St. Albans Road, North Watford near Haynes Pram Shop and close to Bushey Mill Lane, where I learnt shorthand/typing. Mr. Haynes also had a cycle shop on the opposite side of the road near Longspring. The council offices were at the bottom of Beechwood Rise with Dodds hardware shop, an alladins cave nearby. I used to take my sledge with wheels on to get a gallon can of paraffin filled then drag it home. Underhills was the newsagent where I’d buy a packet of Smiths crisps with the little blue bag of salt for tuppence and take it to the Odeon Cinema nearby for Saturday morning ‘flicks’ costing sixpence to get in. I’d crush my crisps to tiny pieces to make them go further. Threshers off-licence was further up the road with a bank on the corner. On leaving school I worked as a junior for the Hertford Handbag Company in Sutton Road. Blowers Ink Company were located on the ground floor. I then joined the Watford Observer working at the offices in the High Street and took a Saturday job at Finlays tobacconists opposite. I didn’t last long there, I was useless at figures. Does anyone recall the legend of The Fig Tree in St. Mary’ Churchyard, I remember that well. It was then on to Odhams the printing giant in North Watford until it closed in 1983. North Watford holds a lot of memories for me as my maternal family originated in Parker Street, off Leavesden Road. Callowland Girls School at the bottom of Leavesden Road and the boys school further up on the left. Redrups butchers, Girlings Bakers, Mrs. Finch’s grocery shop where mum would buy a quarter of butter a week with her rashion coupons and the broken biscuits were a joy. Froomes, another grocers, Mr. Christie’s chemist where he made up all sorts of potions, a real chemist. I still have a bottle of his made up linament which is just a keepsake. Mrs. Rumsby’s hairdressers with the gents downstairs and ladies upstairs. Gregoes fish and chip shop and greengrocers and Albans greengrocers and a cycle shop nearby where I bought my racing bike. So many memories. There was a pet shop near Christ Church in St. Albans Road, the Co-op shoe shop one side and general homeware store on the other where customers paid for their goods and the assistant would put the money into a circular canister, push it into a fitment above her and it whizzed off the what appeared to me as a child, a box suspended in the sky. Someone up there used to take the money, then send the change winging down. I was fascinated. The Co-op also had a dentist, and foodshop and naturally a Gibsons where we’d buy a pound of eights sausages, a Kinghams further up and not forgetting Spurriers bakers, Timothy, Whites and Taylors and Woolworths. I could go on. This page was added on 21/08/2011. My belated response is to Nick Parker (24.2.17 comment). It’s sad this revamped site is so difficult to navigate with comments disjointed. There’s continuity anymore. However, I recall vividly the Foxens pram shop. If my memory serves me well, the daughter, or a relative of the owner, called Pam originally lived at Herkomer Hall in Bushey with her family, and married my late cousin David Anthony. They had two children and Pam now lives in Cornwall and I think runs a B&B. Haynes cycle shop and pram shop were owned by my Grandfather, Laurence Foxen. My eldest brother was born in the flat above the pram shop. Today the name kinghams popped into my head. I looked it up and it was subsumed into Waitrose. I too was born in king street maternity hospital in 1948. I recall my grandmother taking me to kinghams on the 311 bus from bushey. I spent the first 5 years living with my grandparents at 316 park avenue bushey. The bungalow is still there. We moved to a council house in scottswood road number 56. I went to highwood school then to Watford technical high school before we moved to Leighton buzzard in 1963. I remember my mum worked in the finance department in cawdells. She was on the receiving end of the money canisters posted through the tube system from the tills. I recall eating cockles in Watford market and ice cream from rossi’s in the high street. A lifetime ago now. Hello does anyone remember the Haney family? My great grandmother Clara Duce moved from rural Cambridgeshire to Watford in the 1860’s. She bought a shop with yard and accomodation at 197 High street, opposite the Benskins brewery. She is credited with being one of the first people to sell fish and chips. They went on to have several other shops in the town, including one in Vicarage road, where my grandfather was born. They also had shops in High Wycombe, Reading and Windsor. 197 High street was a very old building with tunnels under the yard, and a grapevine reputed to be a cutting of one from Hampton Court.